When a rectifying circuit and a smoothing circuit with a capacitor are provided in the circuit of equipment, the input current waveform becomes distorted and the harmonics are generated. V/F control was the original methodology developed by AC drives manufacturers. One of the weaknesses in V/F drive is starting torque and lack of control. Vector control methodology was developed in the 80s to give better control at lower frequencies but could not go to zero speed. Therefore a third methodology, Field Control, was developed that can give full torque at zero speed. Also, as a side note, most ac drives now have energy savings mode which will adjust the acceleration to keep current low while getting up speed (different AC drives manufacturers do this in different ways), as opposed to following the defined ramp, as most fans are not critical acceleration so you may consider turning on this function for additional cost savings, the larger the motor the more the savings. The carrier frequency is what the base PWM signal runs at. Typically the higher the carrier frequency, the quieter the motor will run, but at the possible expense of damaging the windings or bearings if there is a lot of cable length, or capacitance in the output circuit. If you have an old motor, or are running a significant length of output cable, choose a lower carrier frequency drive. Now, if your instance has only a couple feet away from the AC drive, you can pretty much choose anything you want and not have to worry about the carrier frequency. For experimentation purposes you can select the different frequencies and notice the audible difference in the motor, and if you have a scope with sufficient voltage isolation probes, you can view the ac drive's output voltage and current waveforms. Low is sometimes around 8kHz, and high is about 15kHz for 230/480V drives. There is also usually another parameter for the carrier frequency as well, that either leaves the frequency constant, or allows the frequency to change as the output frequency varies. AC drives are used to stepless speed control of squirrel cage induction motors mostly used in process plants due to its ruggedness and maintenance free long life. AC drive control speed of ac motor by varying output voltage and frequency through sophisticated microprocessor controlled electronics device. AC drive consists of Rectifier and inverter units. Rectifier converts AC in DC voltage and inverter converts DC voltage back in AC voltage. AC drives have a well-deserved reputation for energy savings. But it's important to analyze AC drive various applications carefully to ensure that the system will has expected savings. The nature of the AC drives systems are applied to will determine the extent of possible savings. There are many opportunities for the use of AC drives in various applications. The savings are very compelling. In most cases there is something you can do, but you have to be a little clever when you're looking at retrofits. It's not as simple as slapping an AC drive on instead of a starter and assuming that energy use will drop. Another potential advantage is information. There's a lot of good diagnostic data that you can get out of the variable frequency drive. With that data, facility managers can extract an estimate of power consumed to do some basic measurement and verification. Apart from the VFD built in motor overload protection, internal heat, short circuit and ground fault, protection is provided. The electronic overload protection for the motor also takes into account the reduced cooling when the motor is operated at low speeds without forced ventilation. High quality commercial VFDs are designed to operate from typical industrial power distribution systems with a maximum fault level of ten to twenty times the variable frequency drive rated power. Problems can also occur if a VFD system is installed close to the main power supply or power factor correction capacitors, both of which present low supply impedance to the VFD. Variable frequency drives fitted wit D.C. link chokes are in general unaffected by low supply impedance. The cost of energy is important, but the security and continuity of energy is crucial for many Facilities Management sectors. Maintaining a reliable energy supply requires both businesses and individuals to consume less - and this is exactly what variable frequency drives can help process companies achieve. Put simply, variable frequency drives can be seen as a form of insurance against future energy price increases. They both reduce the bill in proportion to its overall size and they improve the long term business model of the energy industry by increasing the likelihood that it will be able to help the Government meet its energy reduction targets. In conclusion, the evidence is clear; variable frequency drives are one of the lowest risk investments Facilities Management pie can make to bring its environmental and economic goals a step closer to fruition. If you are part of a buying team, or working at management level for a Facilities Management company that uses substantial amounts of energy, then variable frequency drives could be a viable solution to provide significant energy savings in many ac motor applications. All you need to do is adjust the way you view the system cost of each solution you buy, where lifetime cost is considered over purchase cost. 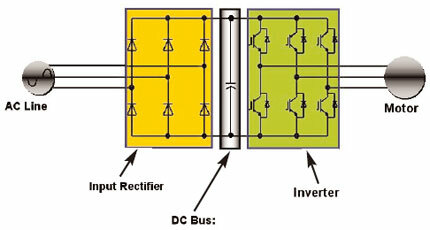 AC/DC inverters, cited as rectifiers, are generally build with passive components. Inherent to the operation of diodes, does the discretization of current imply a non-sinusoidal current demand. In combination with the present grid impedance this current distortion results into a distortion of the supply voltage. In Section 2 the nature and limits of the supply voltage at end user are presented. If the electrical power consumption at industrial plants is regarded, more than 65% of all generated power is consumed for electromechanical conversion. Induction motor have several advantages in respect to other electric motors and as a result a lot of effort has been done to increase the efficiency of these machines (Section 3). Induction motor have one disadvantage, the fact that the mechanical speed of the machine is directly coupled to the frequency of the supply voltage, which limits its flexibility when supplied directly from the grid. Although the usage of AC drive can adjust the supply frequency, only 25% of the newly installed machines are supplied from an AC drive. Regardless of the application, ac electric motor control physics remain inescapable. The relationship between the volts/Hz ratio is critical for torque generation in both acceleration and deceleration, as well as controlling overhauling forces against an ac motor. When one or the other value is varied with the other remaining fixed, torque loss is going to happen. You can't get away from that and the loss is significant. The capability of variable frequency drives (VFD) to keep both at a balance sequence throughout the RPM range of the ac motor, is just one of many features rendering them superior. A soft starter cannot regulate frequency. If it could, it's no longer a soft start, it's a VFD, that's the difference. Whether or not variable frequency control is going to create problems depends on a number of factors, most of which emanate from the quality of the ac drive construction or false blame. All ac drives are not the same. Blaming an ac variable frequency drive for a host of problems is generally done when there is a lack of understanding of the ac drive construction and/or capabilities. I deal with this concept continually. Common occurrences are drives tripping on overcurrent faults, basically when they have that capacity of protection built in. Field techs have changed out variable frequency drives that can protect, to a lesser quality that can't, believing the problem was solved only to burn up motors a week later. That's just one of a myriad of examples where, instead of a simple system evaluation, a sense of black box voodoo is applied with the VFD as the errantly assumed culprit. From the ac drive basics, we know it may be able to offer significant energy saving opportunities for specific applications. However, when considering purchasing and installing a variable frequency drive care must be taken to ensure that it is the correct selection and that it is properly applied in order to achieve optimum energy savings. This paper provides the basic guidelines on issues to take into account when selecting a AC variable frequency drive. Is a variable frequency drive necessary? Overall, the most appropriate applications for variable frequency ac drives are those where the output is less than 100% utilized by the process and is variable, examples include where the output of a pump or fan is regulated, cycled on/off, re-circulated or vented. Some form of investigation may be required to determine the relationship between the capacity of the ac motor system and the actual requirements of the process; all monitoring should be conducted over a period of time. AC drives provide many benefits. Energy savings is among them since the AC drive allows precise speed control of a standard ac motor and, in many applications, that ability improves process control. Other benefits include that AC drives can maintain torque at levels to match the needs of the load, reduce mechanical stress on three-phase ac motors by providing a soft start, and improve an electrical system's power factor. This also reduces the voltage sag that can occur when a large ac motor starts quickly. Voltage sags can dim lights and cause other equipment to shut down or restart. Depending on the ac variable frequency drive manufacturer, the switching frequencies of an AC drive ranges from a few kilohertz to as high as 30 kHz. Most of the true RMS handheld multimeters in the market have high AC bandwidth and are able to capture all the unwanted high frequency switching components generated by the AC drive. Using a handheld multimeter with a switchable 1-kHz low pass filter feature, the handheld multimeter is able to obtain accurate voltage and frequency measurements on AC drives. This eliminates the need for technicians to guess the AC drive output. AC drive usage has increased dramatically in HVAC applications. The AC drives are now commonly applied to air handlers, pumps, chillers and tower fans. A better understanding of AC drives will lead to improved application and selection of both equipment and HVAC systems. 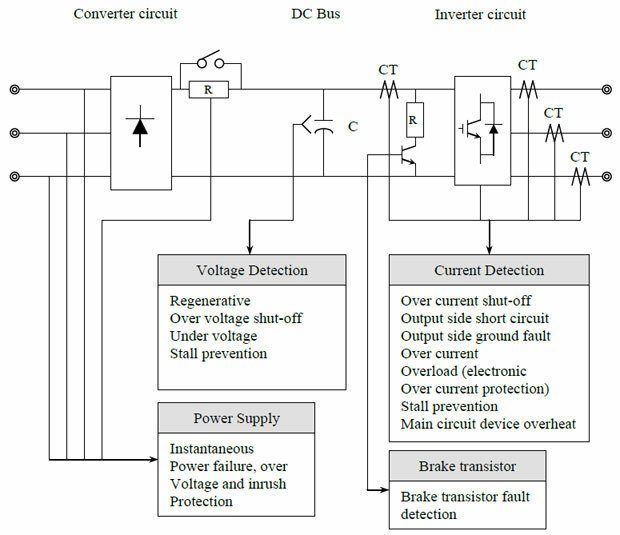 This article is intended to provide a basic understanding of AC drive operation principle and theory, and AC drive benefits. AC drives provide the most energy efficient means of capacity control. AC drives have the lowest starting current of any starter type. AC drives reduce thermal and mechanical stresses on motors and belts. AC drive installation is as simple as connecting the power supply to the AC drive. AC drives with AFE technology can meet even the most stringent harmonic standards and reduce backup generator sizing. AC drives provide high power factor, eliminating the need for external power factor correction capacitors. AC drives provide lower KVA, helping alleviate voltage sags and power outages. Copyright © 2019 AC Drive, All Rights Reserved.